An old woman dreams of going home in Peter Masterson's tenderhearted cinematic adaptation of Horton Foote's play, The Trip to Bountiful. Foote, who received an Oscar nomination for adapting his own play, also wrote the screenplays for To Kill a Mockingbird, Of Mice and Men, and Tender Mercies, writes with a kind of sun-drenched nostalgia that looks at the world through rose-colored glasses, even at its darkest, and that positive spirit permeates The Trip to Bountiful at every turn. The film is anchored by an Oscar-winning performance by Geraldine Page as Mrs. Watts, the elderly hymn-singing protagonist who lives with her work-obsessed son, Ludie (John Heard) and his self-absorbed wife, Jessie Mae (Carlin Glynn). Stuck with Jessie Mae's nagging and insistence that she sit around the house all day and do nothing (and never, ever, sing hymns), Mrs. Watts longs to escape and return to her hometown of Bountiful, a tiny farm community all but forgotten by the rest of the world. Squirreling away her pension checks (which Jessie Mae demands be turned over as rent), Mrs. Watts saves up her money and waits patiently for her chance to run away. And when that moment finally comes, she jumps on a bus and skips town, heading toward Bountiful with a heart full of hope. Along the way, however, she discovers that no one remembers Bountiful. No trains go there, no one even knows it exists. But it exists in her heart just as strongly as it did when she lived there. Determined to get to Bountiful at all costs, she strikes up friendships with fellow travelers that carry her ever closer to her destination, finally finding a kind of personal freedom she had forgotten was possible. 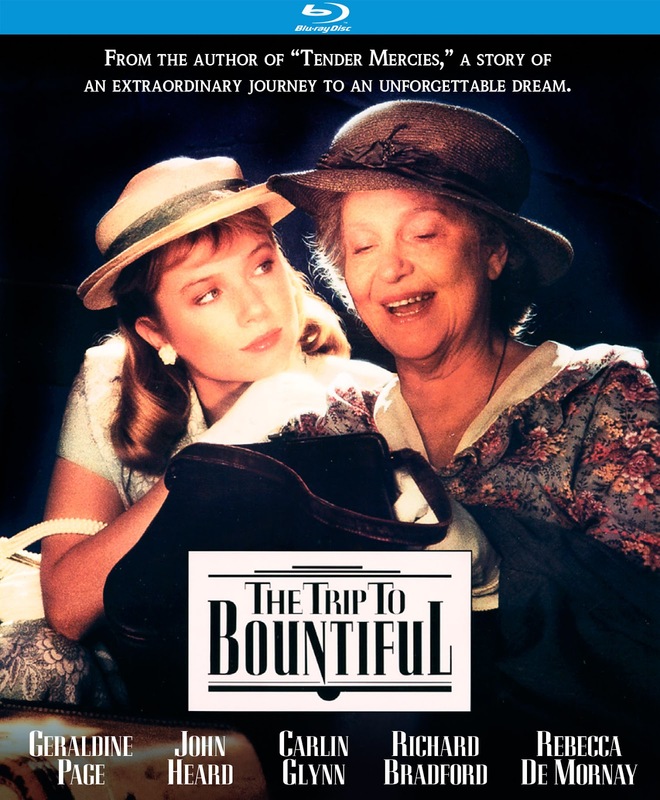 The Trip to Bountiful is a lovely, nostalgic film about going home - even if the home you remember no longer exists. Home, in this case, is more of an idea than an actual place, Bountiful having long ago faded from reality to memory. Foote hammers that point home perhaps a bit too strongly, tending toward holding the audience's hand through its ideas rather than conveying them naturally. But Page is so good as Mrs. Watts that it's hard not to become invested in her single-minded journey. Accompanied by a score made up mostly of old hymns (most notably "Softly & Tenderly"), The Trip to Bountiful invites viewers to come home, whatever that word may mean for them. Masterson's relaxed direction makes for pleasant viewing, even as it skews toward over-emphasizing its themes, a weakness carried over from Foote's screenplay. Jessie Mae's character is just so cartoonishly awful that it's hard to take her motivations, and therefore the crux of the plot, seriously. Thankfully, Page's performance is so strong that it grounds the film when it threatens to disappear into its own nostalgic haze. She's so real that one almost wants to reach into the film and give her a hug, despite the ridiculousness of the mostly over-the-top histrionics of Jessie Mae's overbearing villain. The new Blu-Ray from Kino Lorber Studio Classics has cleaned up the film significantly, and its warmly filtered cinematography is lovely in high definition. 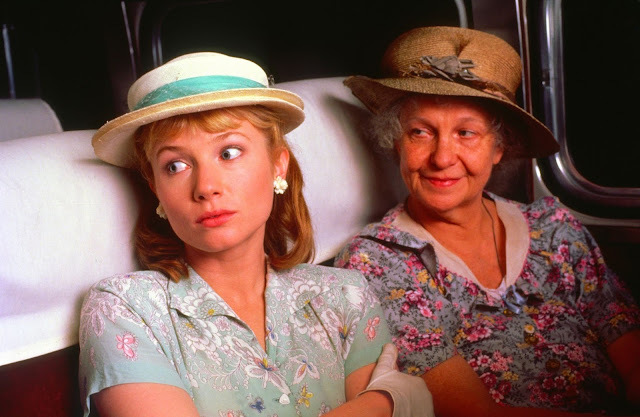 Sure, it looks as if its lost in a hazy dream, a hallmark of films of this nature from the era (see Driving Miss Daisy, The Whales of August, and The Man in the Moon), but it's hard to resist Page's stalwart Mrs. Watts and her determination to return to the place of her childhood. It's a theme that feels perfectly modern, and yet rather than weaponizing its nostalgia the way so many modern films do, The Trip to Bountiful acknowledges that home may not be exactly the way we remember it. We may not be able to physically go home, but its effects last a lifetime, even if we can never quite recapture them in quite the same way. At a time when it's easy to become lost in nostalgia for a better time, it's a sobering, if ultimately uplifting, lesson to learn. THE TRIP TO BOUNTIFUL | Directed by Peter Masterson | Stars Geraldine Page, John Heard, Carlin Glynn, Richard Bradford, Rebecca De Mornay | Rated PG | Now available on Blu-Ray and DVD from Kino Lorber Studio Classics.